Home / Costume Articles / Game of Thrones Costumes / My New Daenerys Targaryen Costume in Qarth! Hello all! I’m back again with an all new Daenerys costume! This one was the hardest by far! Khaleesi dresses fancy in Qarth! The Game of Thrones has such amazing costumes designers! With this costume, as with the last Khaleesi, I decided to make my wig. 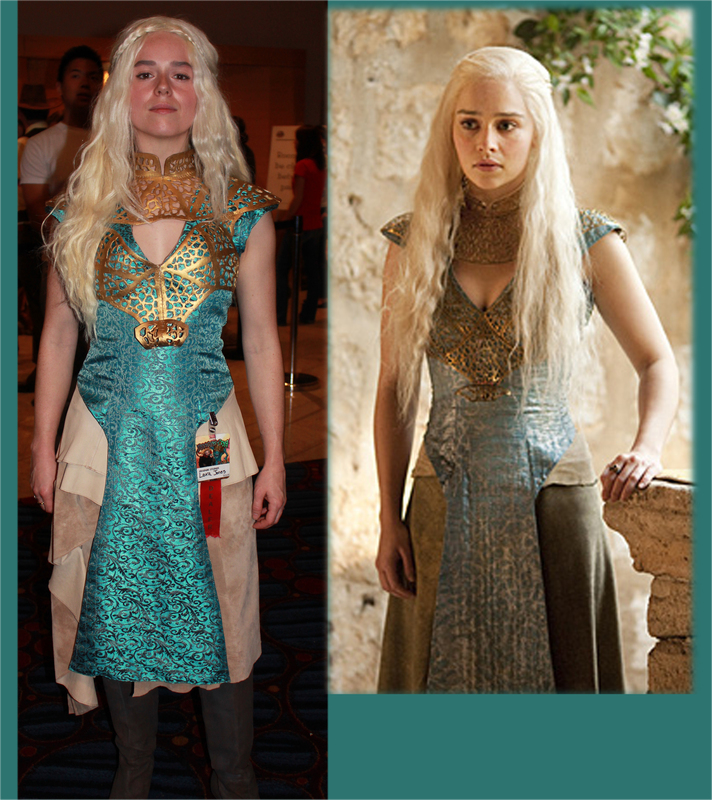 The first wig I made for the Daenerys costume last year didn’t fit quite right. So, I scoured the wig supply shops looking for the perfect color hair tracks, and I found them! Somehow I was able to find hair that is one shade lighter than 613 called white, but isn’t exactly white. Its also able to be heat styled because its a mix of human and synthetic. I bought a hair net and started to sew. Somehow I was able to complete it in a reasonably shorter period of time than my last wig. I still had to style it with my triple-barrel wave curling iron. 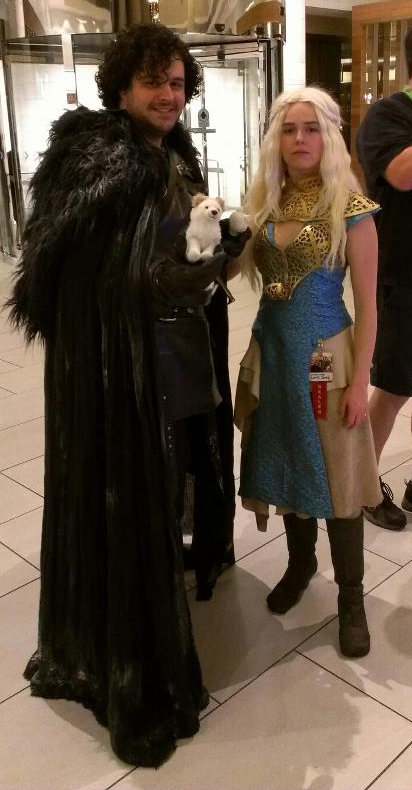 Here is another image of Daenerys Targaryen and one of her Dothraki from the Game of Thrones! I had to make my pattern for the blue dress that is underneath the metal-like armor. Since I couldn’t find the perfect fabric for the piece, I actually had to modify the best fabric I could find. I sewed in lots of vertical stitching using silver thread to compliment the silver lining underneath. I really feel that it gave the piece a unique feel. The hardest part of the costume was making Khaleesi’s faux metal piece. This seems to be the style worn by many people in Qarth. I started out making the pattern on my body-form. Then I cut it out of white foam. All of the tiny cut-outs in the foam must have taken me at least 6-8 hours to complete. Once they were cut, I then had to hand-sew each piece together with gold thread. I believe the next one I make will be out of leather. Once assembled, there was the matter of painting it. I used a combination of Rub and Buff and acrylic paint. I can’t believe how amazing it turned out! It actually looks like metal in photos! Daenery’s shirt and skirt topper are made from one big suede skirt I found at my local thrift store. I modified a lot for this costume, and I feel like it worked out great! The only thing I still really need for this costume is a better pair of boots. Khaleesi wears light grayish-brown boots with buckles. Hopefully I will be able to find them soon! Once I am able to schedule a photo shoot, I will be posting better pictures of Daenerys Targaryen that have high resolution details of every part of the costume! Here is one more photo I have from Dragon*Con! I found a great John Snow! Oh how I love The Game of Thrones! I’m attempting do do the same dress only with the violet fabric and leather. I’ve got all my fabric. Just have to figure how to put it together now. Any pointers? I’m pretty nervous about making it look just right. If you could help that would be wonderful! Thanks! Hi there! If you have a body form, you can drape all of your pattern pieces to make sure they sit and fit appropriately! If you can’t do that, then I would recommend buying a dress pattern and altering it. If you want to look at up close images of the costume, you can find them by doing a search on flickr for the person peddler_creates’. Then you can look in their FIDM 2012 TV folder. Also, I would recommend buying light brown leather that has been dyed all the way through. You want to buy a leather that is very sturdy, but can still be sewn through with a leather needle! I hope that helps a little! Thanks! Hello! I actually made the armor out of foam, and then I painted it. I would recommend to make it out of very thin leather though, it will be much more durable that way. After you make it, all you need to do is paint it with gold rub, which can be found at Hobby Lobby. Thanks!